Apple may be known for its advertising prowess, but this little marketing coup is going to go down as one of the most hilarious ad placements in recent history. 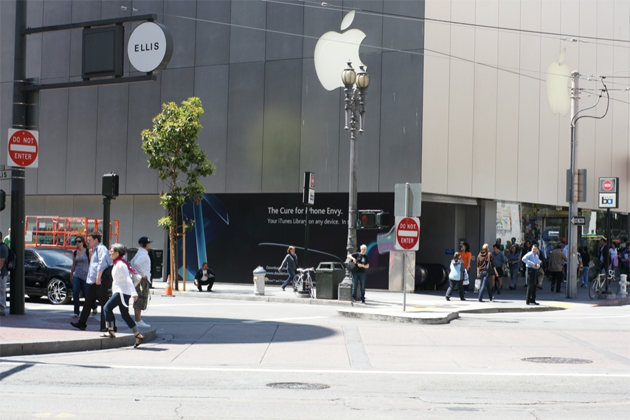 doubleTwist, the company co-founded by renowned software reverse engineer DVD Jon, has managed to place a banner for its product directly next to the main entrance to Apple’s flagship San Francisco store. 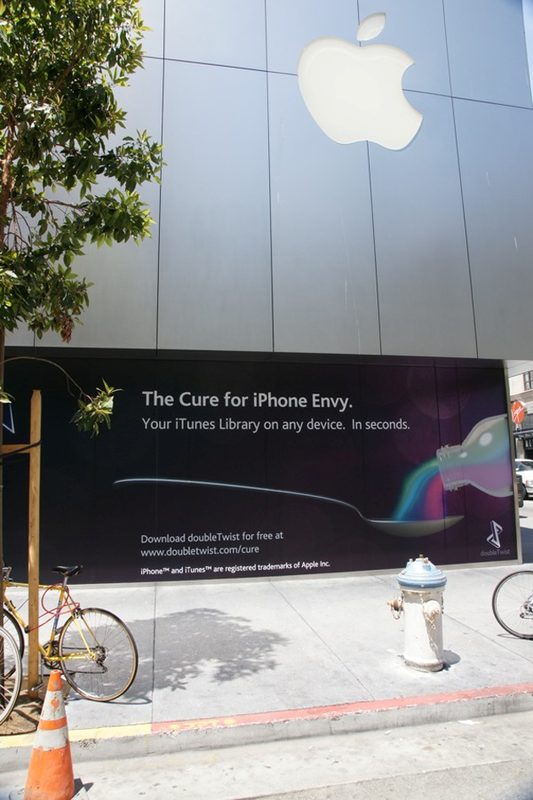 The ad invites passersby to try “The Cure for iPhone Envy”, which they can use to access their “iTunes Library on any device. In Seconds”. It’s clearly a message that Apple doesn’t want anything to do with. We’re hearing that Apple employees are currently scratching their heads as to how this appeared. So how did this wind up only a few feet from the store’s entrance, and directly beneath a giant Apple logo? Apparently the window technically belongs to BART, the Bay Area’s commuter transit system. doubleTwist got in touch with an ad agency that BART deals with and leased the window, giving them the chance to plaster their ad just below the Apple logo in its full glory. This is apparently the first time the window has been used for this purpose (before it just sat bare). And because everything was done legally, Apple’s going to have a hard time getting rid of it. While DVD Jon has a long history of reverse engineering digital media security, doubleTwist is a perfectly legitimate software application that makes it easy to manage media files for a variety of hardware devices. It’s sort of like iTunes, except it works for nearly any device — not just your iPod and iPhone (you can find an extensive overview here, and the app now supports both Windows and Mac). Given that one of the iPod’s biggest advantages over competitors is the seamless experience it offers to users, Apple probably isn’t a big fan. Update: The ad has apparently been taken down, as noted by a few commenters, but Jon Lech Johansen (AKA DVD Jon) has tweeted that it will be back up soon. Thanks to Chester Ng for the tip.